If you’re looking to train your cockatiel, you’ll be glad to know that they train easily when they are rewarded with affection and treats. Cockatiels are intelligent and many are entertaining pets and can learn several different tricks. You’ll be successful if you keep sessions with your bird short, productive and rewarding. Begin by letting your cockatiel become accustomed to your hand. Do this by offering your bird his favorite treats through the bars of the cage. He will become comfortable with your fingers and hands with this technique. Offer treats to him with your hand in the cage once he adjusts to taking food from your fingers. After he begins to accept treats from your hand, you must attempt to get him on your finger. Try placing your finger in front of him, like a perch, and touching his chest lightly. He will eventually step on your finger. Move him out of the cage slowly after he becomes comfortable on your finger, This will take time and patience but soon your bird will come to your hand and let you take him out of the cage. To get your cockatiel on your shoulder, extend your arm out. Usually, the bird will walk up your arm and perch on your shoulder. Discourage your cockatiel from nibbling your skin, fingers or ears while he is young. Young cockatiels like to explore with their beaks and this could lead to nibbling that might turn into biting. Move your hand away from your cockatiel and ignore any biting when he bites. Return to your activities as planned and your bird will forget the biting since you did not reinforce it in any way. 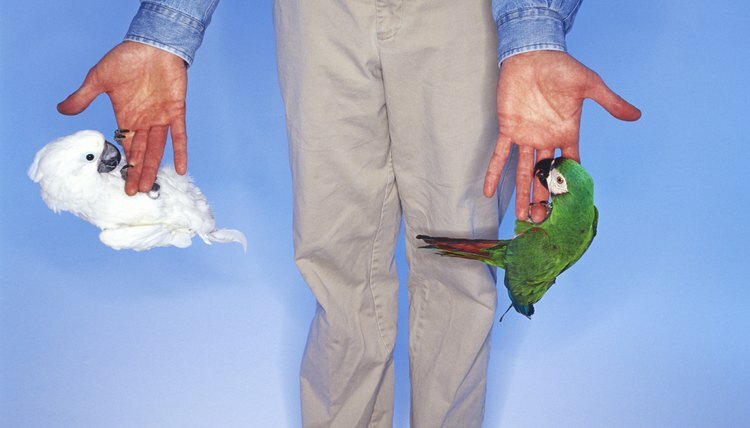 Scolding your bird or swatting at his beak reinforces biting and causes them to be fearful of you. Talk to your bird with a calm voice as much as possible. This will allow him to become accustomed to your voice and presence. Play with your bird. Birds get bored and playing with them builds their trust in you. Be patient. Cockatiels have different personalities and some may learn more quickly than others. Reward you bird’s good behavior with affection and treats. Avoid wearing jewelry. Cockatiels love shiny earrings and necklaces and will nibble and sometimes break jewelry pieces. Don’t let your bird nibble on house plants, as many are poisonous.